Sherman Lea became Roanoke’s second black mayor in 2016. 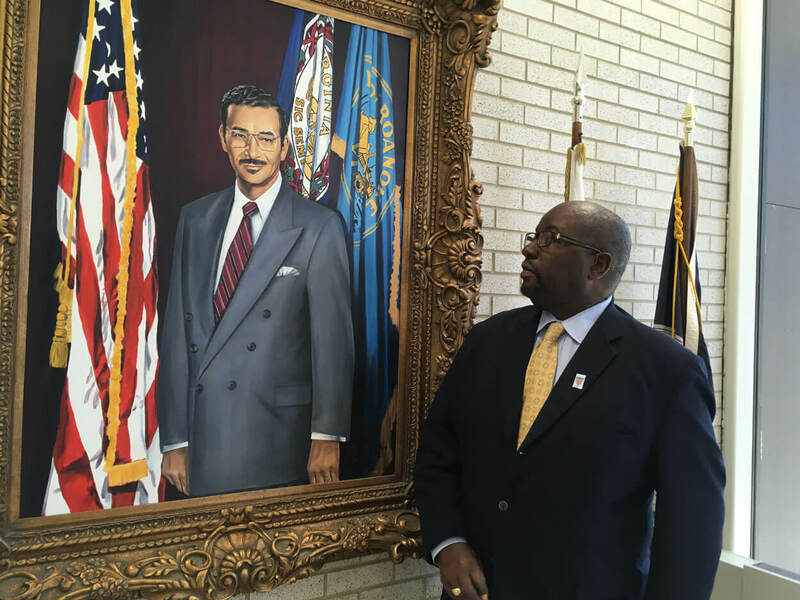 The first was Noel C. Taylor, who was mayor 1975-92 and whose portrait looks over the lobby of the city municipal building that is named for him. Photos by author. Stand at the corner of Market Street and Church Avenue in downtown Roanoke, Virginia, and you’ll quickly see why it has become a model for industrial New South and Appalachian cities looking to reinvent themselves. Behind you stands a parking garage, crowned by a newly built Hampton Inn. Across Church Avenue is a taproom opened in August by Deschutes Brewery, an Oregon-based craft brewery with plans to eventually build a production brewery in Roanoke. Walk up Market Street and you’ll pass by the city’s 135-year-old farmers market, then the 95-year-old City Market Building, which got an $8 million renovation in 2011 and houses an all-local food court. Throughout downtown, you’ll see numerous millennial-aged professionals who, attracted by the prospect of urban living within biking distance of the Blue Ridge Mountains, have reversed Roanoke’s decades-long population decline. Continue walking northwest, however, and you’ll enter Gainsboro—Roanoke’s oldest neighbor-hood and onetime home to African American icons such as Oliver Hill and Oscar Micheaux, but which now is rattled by generational poverty. Roanoke’s problems extend well beyond this single neighborhood. Black neighborhoods in the northwest and White neighborhoods in the southeast are suffering. Roanoke struggles with a 20.6 percent poverty rate that’s well above the Virginia average of 13.0 percent. In 2015 a New York Times database collected data from a 20-year Harvard University study of geography’s role in income mobility and ranked Roanoke in the bottom 10 of 2,478 localities for helping poor children up the ladder. The ranking, publicized by The Roanoke Times in a 2017 series of stories and public meetings, crystallized the problems that had always lurked just below the surface in Roanoke: Long-term neighborhood segregation, growing income inequality, quality of schools, violent crime rates, a smaller rate of two-parent families—and their effects on the long-term prospects of the city’s poorest children. Roanoke's poor ranking is eye-popping, but it's hardly alone. The study found that the South lagged well behind the rest of the country in terms of economic mobility for the poor. From a distance, Roanoke looks like a success story for Southern reinvention, using its outdoor assets to attract a young creative class and build a new image as an outdoor-centric beer and biomedical destination. Yet while this new model clearly is delivering new prosperity and jobs for some, the city faces significant challenges in spreading that wealth across neighborhoods to its most vulnerable residents. That tension can be seen in the systemic issues facing public education—an institution widely considered a path out of poverty, but one that has been shaped by political and social conflicts that have not always been beneficial for students. Roanoke Mayor Sherman Lea, elected in 2016 as the second Black man to hold the office, referenced the challenge of poverty in his state of the city speech in August. A Danville native and former probation and parole officer for the Virginia Department of Corrections, Lea rose to prominence in Roanoke through his time on the school board, organization of community sports events targeted at at-risk youth, and service on a city council that moved from bitter factional politics to a team-oriented stability. He, along with Anita Price, a former middle-school guidance counselor who last year became Roanoke’s first Black female vice mayor, generated new hope when they were elected as the city’s top two leaders in spring 2016. Yet poverty is a complicated, persistent problem that was created by a toxic blend of factors— policies that enforced segregation by race and class, dysfunctional government and non-profit agencies, white flight, and more—and is stubbornly persistent. Even when the political will exists to fight it, the right course isn’t always obvious. Railroad tracks bisect Roanoke, marking the dividing line between downtown, which has become a hip neighborhood populated largely by young professionals, and Gainsboro, a historic Black neighborhood that predates Roanoke itself. Located at an important crossroads on the Great Wagon Road, the town of Big Lick became Roanoke in the 1880s when the Norfolk & Western Railway built its headquarters there, launching a period of rapid growth and industrialization. Racial and ethnic tensions grew through the end of the 19th century, as immigrants flocked to the so-called “Magic City” in search of economic opportunity. That included a significant number of Jewish, Greek and Lebanese immigrants—the latter of whom were labeled “Syrian” since they migrated while the Ottoman Empire still existed—as well as many single Black men. By the early 1890s, about 30 percent of Roanoke’s population was African American. Black men made up a quarter of the male population in 1893 but represented more than half of arrests. The diversity that resulted from the intense migration to Roanoke early in its life as a railroad town remains today. People from more than 100 nationalities make Roanoke home, and nearly 30 percent of its population is African American—significantly more than its Appalachian peers in Asheville and Knoxville, and roughly comparable to Greenville, South Carolina. As one of the few cities amid a large rural region, Roanoke is an urban anchor for eastern Appalachia. Its cluster of healthcare and social services like buses, homeless shelters, refugee assistance and other programs make it a continued destination for people around the region and world. Lea’s city council reflects the city’s racial, ethnic and professional diversity. The entire, 7-member council is elected at-large, but it includes two African Americans, one Lebanese American, five men and two women, all from a variety of professional backgrounds. Most council members have served since at least 2010, a period of relative political stability and economic growth. The railroad closed its last offices in 2015, but the symbolic moment was washed out in a flood of craft beer a year later, when Deschutes Brewery of Bend, Oregon, and Ballast Point Brewing and Spirits of San Diego both announced plans to build production breweries in the Roanoke Valley. Paired with real-estate developers’ use of historic tax credits to transform a downtown of vacant warehouses and office buildings into freshly renovated apartments, Roanoke seemed to have successfully transformed the community’s self-image from that of a past-its-prime blue-collar industrial hub to a revitalized, hip outdoor city. Beneath that narrative of community reinvention, however, Roanoke still is grappling with wicked problems faced by other southern cities. The 2015 Harvard study, which used anonymous tax returns to track households with children born between 1980 and 1992 for a 20-year period through 2012, showed just how bad the problems ran. Those things should include expanding bus service and moving workforce development programs from the technical schools and community colleges in the suburbs around Roanoke to the inner city, Jeffrey said. Besides city government, a small galaxy of non-profit service organizations also work to combat poverty, including Total Action for Progress, a half-century old agency that employs more than 300 people and serves about 5,000 with an array of programming, including employment assistance and pre-school. Even those agencies are torn between funding and mission, though: when asked the biggest challenge to addressing poverty in Roanoke, TAP Executive Director and Roanoke City School Board Chairwoman Annette Lewis said it was obtaining operating funds to keep the organization going. The push and pull between prosperity and poverty is felt most sharply in the city’s public schools, which for decades have been both ladder and battleground—the place where poor youth have the best chance to better their situation, but also an arena in which civil rights battles were fought through the mid-20th century. Roanoke gave rise to both heroes and villains in the battles of the 1950s to desegregate schools. As with other cities around the country, Roanoke saw significant White flight from the city into the suburbs in the surrounding counties. As recently as the mid-2000s, city schools struggled academically, with a graduation rate that lagged well behind the Virginia average. Those measures have significantly improved over the last decade, although critics like Jeffrey continue to question whether public schools are functioning effectively for the city’s most vulnerable youth. Anita Price became Roanoke’s first Black woman vice mayor in 2016. She has been a Roanoke city councilwoman since 2008 after working in the city's schools. She sits in the Harrison Museum of African American Culture, which her husband leads. Amid the tall stacks of books that cover the desks of Roanoke City School Superintendent Rita Bishop’s office are several copies of J.D. Vance’s treatise on Appalachian poverty, Hillbilly Elegy. Bishop gave a copy of the book this year to the principal of every school. At least three times in our interview she mentioned page 226 and its discussion of what Vance calls ACEs, or adverse childhood experiences. That page includes several examples such as being humiliated by parents, being physically abused, having separated or divorced parents, and living with an alcoholic or drug user. To this list Bishop has scribbled a series of additional traumas that have affected her students: homicide, worrying about food, eating only cheap food, lack of dental care. Set aside the fact that the superintendent of an urban school system is using a book that’s been touted as a skeleton key for Trump’s America to address wicked problems in a heavily Democratic city. Bishop is giving a book ostensibly about poor Whites in Appalachia to spur her principals to think about poverty across racial and class lines in an urban school district. Bishop said she hesitates to close schools on snow days because she knows that will translate to missed meals for some students. She credited a state program that has provided free breakfast, lunch, and even supper to poor students for improvement in test scores. Bishop is in her second stint working for Roanoke’s schools. In her first, from 1994 to 2004, she watched the city’s free-and-reduced-lunch rate climb from about 50 percent to more than 60 percent. Meanwhile the system’s graduation rate sat well below 60 percent. In the mid-2000s, Bishop moved to a Pennsylvania school system where she pioneered an alternative school for high-school students who had fallen behind. Bishop brought the academy concept with her when she was hired in Roanoke as superintendent in 2007. Her proposal to close an elementary school to transform it into Forest Park Academy sparked controversy, in large part because the school had been within walking distance of Black neighborhoods. Lea and the rest of council backed Bishop and the school board. In May, Forest Park celebrated graduating its 1,000th student. Meanwhile, Bishop said schools have implemented other measures to fight poverty. They include a focus on technical skill-based education; a regional program offering free tuition to community college for high-school graduates; support from churches and libraries; and a VH1-sponsored program that offers free instruments for students in music classes. Meanwhile, the city schools’ on-time graduation rate rose from less than 60 percent in 2007-8 to 89.67 percent for 2016-17. Black kids graduated at an 89.97 percent rate, and economic disadvantaged kids at 89.54 percent. That graduation rate falls just short of the Virginia average of 90 percent—but Bishop challenged even Virginia’s highest performing schools to match the achievement gap, or lack thereof, that Roanoke has achieved. Bishop said she doubted the veracity of the Harvard study findings, and that she planned a visit review its data and methodology. The superintendent has a shrewd eye for numbers, and has found ways to boost Roanoke’s, as evidenced both by the graduation rate and a September examination of public records by the Roanoke Times found she approved 451 requests for students to retake standardized tests. All but one of the city's schools are fully accredited, with the last being partially accredited. Famed civil rights lawyer Oliver Hill grew up in a Gainsboro home that still stands today. Roanoke's segregated neighborhoods contributed to its poor New York Times ranking of communities based on the Harvard study. The resulting challenges faced primarily by its Black students bely the hopes and promise of the fight to integrate the country's public schools. That fight prominently involved two mid-century Roanokers whose legal duel climaxed at the same moment the city launched a movement that devastated its Black neighborhoods and set the stages for the challenges that continue today. Iconic civil rights lawyer Oliver Hill spent his much of his career fighting to give Black children the opportunity to close the achievement gap in the same classrooms as White children. Hill spent his formative childhood years growing up in the Gainsboro neighborhood, and after attending Howard University School of Law, Hill opened his first practice in Roanoke in 1934. Hill became part of a legal team that fought for integration in schools on behalf of the NAACP, and he filed a school lawsuit in Prince Edward County. Another former Roanoker, Lindsay Almond, fought the suit as Virginia attorney general. The case became one of several rolled into Brown vs. Board of Education, the landmark 1954 case in which the U.S. Supreme Court ruled that segregated schools were unconstitutional. Harry F. Byrd, a U.S. senator and Virginia political boss, refused to accept the ruling and instituted Massive Resistance, which shut down school facilities instead of integrating. In 1957, Almond ran for governor as a segregationist Byrd Machine candidate. Almond won as a segregationist, but the defining moment in his term as governor came after the Virginia Supreme Court and a federal judicial panel both found Massive Resistance unconstitutional. Two weeks later the rulings, Almond announced that he would not resist the court decisions, effectively allowing public schools to desegregate peacefully—a process that took decades to play out. The Dumas Hotel is one of the few historic buildings still standing on Henry Street, a Black business district that was all but destroyed by urban renewal. Even as Roanoke began integrating its schools, however, the city government pursued policies that destroyed its historic Black neighborhoods. A year after Brown, Roanoke began urban renewal, or redevelopment of core areas for new purposes. Advocates argue that urban renewal replaced “blighted” housing with community amenities, but it also destroyed longstanding minority neighborhoods in the name of redevelopment. In three projects that took place in 1955, 1964 and 1968, the city bulldozed dozens of historic neighborhoods blocks to make room for Interstate 581, the Roanoke Civic Center, a post office, a housing development and several businesses including a car dealership and Coca-Cola plant. The destruction forced residents within the old neighborhoods to relocate and destroyed Black-owned businesses. Rev. F.E. Alexander had founded The Roanoke Tribune in 1939. He retired in 1971, when his daughter, Claudia Whitworth, purchased it. Whitworth, who had begun working there in 1945, still publishes the paper today. She was publishing it in 1983 when she got a call one morning that bulldozers were demolishing her building. Everything was lost—the press, the photo equipment, the archives, all that history. The civil rights movement reached Roanoke in the midst of urban renewal. Unsettled by the tumult and violence in other southern cities, a group of Roanoke businessmen formed a secret committee to quietly integrate the city. Their efforts began in August 1960, when two women and a boy walked up to the lunch counter at Woolworth’s, ordered and sat down to eat without incident. Mayor Sherman Lea in his office. Today, Roanoke remains a highly segregated city, not just by race but also by class. The lines blur, of course, but longtime residents know that rich Whites live in southwest, poor Whites live in southeast, Blacks live in northwest, and northeast is more of a melting pot. Common gathering places are rare in 2017. The schools reflect that segregation. Even an attempt several years ago to redraw attendance zones didn’t help, in part because of the long-term effects of White flight; many Whites who could afford it moved out of the city into the county. Even counting that, however, activist Jeffrey charges that the school board and city council botched the new districts, selecting one of the most segregated plans. For its ongoing problems, Roanoke does stand out as one of the western Virginia localities friendly to minority elected officials. The congressional districts to its north and south voted in higher percentages for Donald Trump than anywhere else in Virginia. Yet Roanoke voters last year elected Lea and Price as mayor and vice mayor. In the Virginia General Assembly, the Roanoke Valley delegation includes two Arab-American delegates who both grew up in western Virginia: Democrat Rasoul and Republican Greg Habeeb. On paper, Lea and Price, with their backgrounds in corrections and education, would seem to have the right skills and experience to substantively address the challenge of poverty. Longtime critic Jeffrey argues that their willingness to collaborate with the business establishment undermines their credibility. Yet while Jeffrey’s two decades as an outspoken critic of Roanoke’s institutions and elected officials demonstrate his will and persistence, his activism has been marked by a long string of political defeats that include losing elections for Congress, the House of Delegates, mayor and NAACP branch president. For their flaws, Lea and Price have demonstrated the ability to move voters, which in turn gives them the chance to use that political will in service of fighting poverty. Future generations will decide whether they were successful, but for now, it’s in the hands of those elected officials with the power to make a real difference. In doing so, perhaps they can make Roanoke a model not just for community reinvention but for making a difference in the lives of those who need it most. Mason Adams grew up in Clifton Forge, Virginia, and has covered communities in the Blue Ridge Mountains since 2001. He writes from a dairy goat farm in Floyd County, Virginia.